Corals are part of the cnidarian phylum, which means they are biological relatives of sea anemones and jellyfish. Corals are formed by a multitude of tiny genetically similar animals called polyps. These polyps are usually colonial, and able to produce a calcium carbonate skeleton that provide them with shelter and protection. 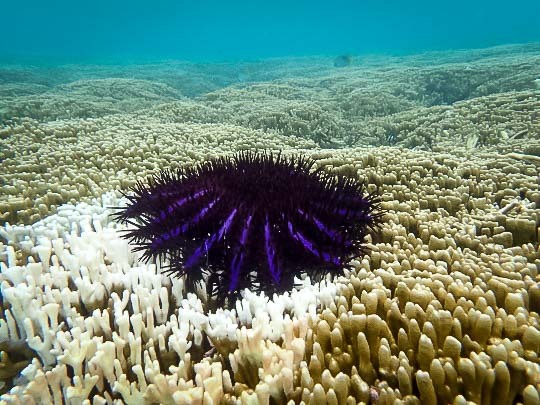 Corals live in symbiosis with unicellular algae called zooxanthellae. These symbionts leave within the coral tissue, and are able to transform light energy into chemical energy and sugars (photosynthesis). Those sugars are directly transmitted to the coral host, and represents 80% of the coral nutritional input. You may also be interested in our Reefscapers Diaries: 2017 / 2018 / 2019, or visit our Coral Frame Collection to see your own sponsored frame. 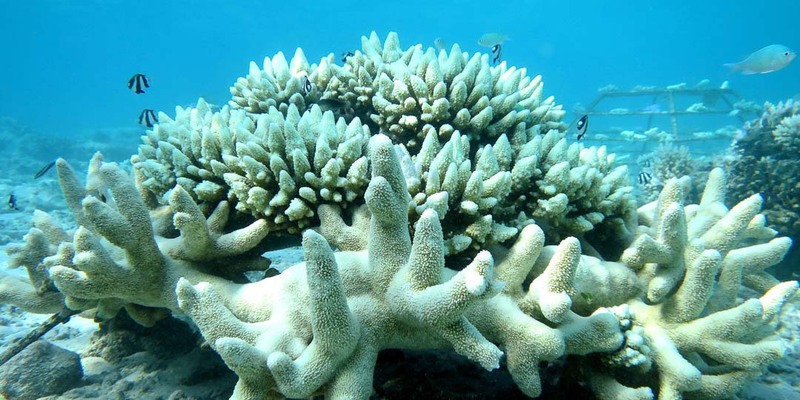 When corals face environmental stress such as an increase in the sea surface temperatures they start to eject their symbiotic zooxanthellae as they have started to over-photosynthesise and produce toxic levels of oxygen. 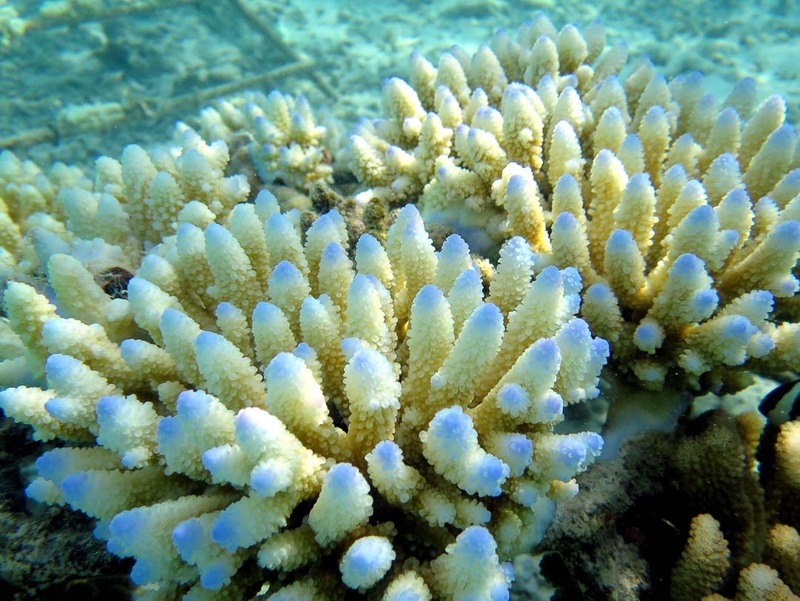 This stress response, despite what it may seem, is actually a survival tactic for the coral. 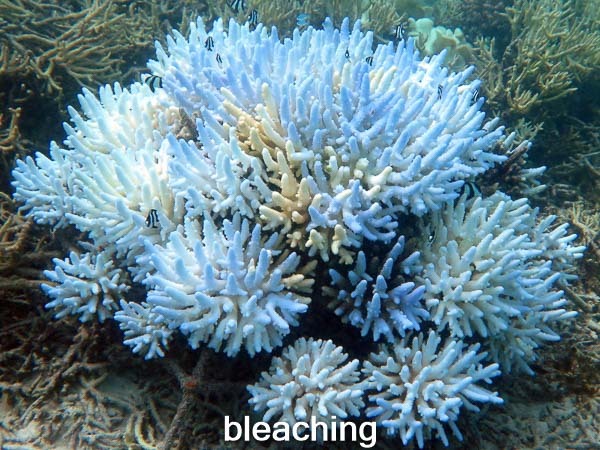 By reducing the number of zooxanthellae in their cells they reduce the amount of oxygen that is produced, however, by doing this the corals’ colouration is also removed, leaving them much paler than normal and sometimes completely white. It is at this point that we say the coral has bleached. Despite their pale appearance, the loss of their algae does not explicitly mean they are dead. These stressed colonies are able to survive for up to a few weeks through active feeding mechanisms alone. During this time, corals are able to regain their algae should environmental conditions return to a manageable, stable level. 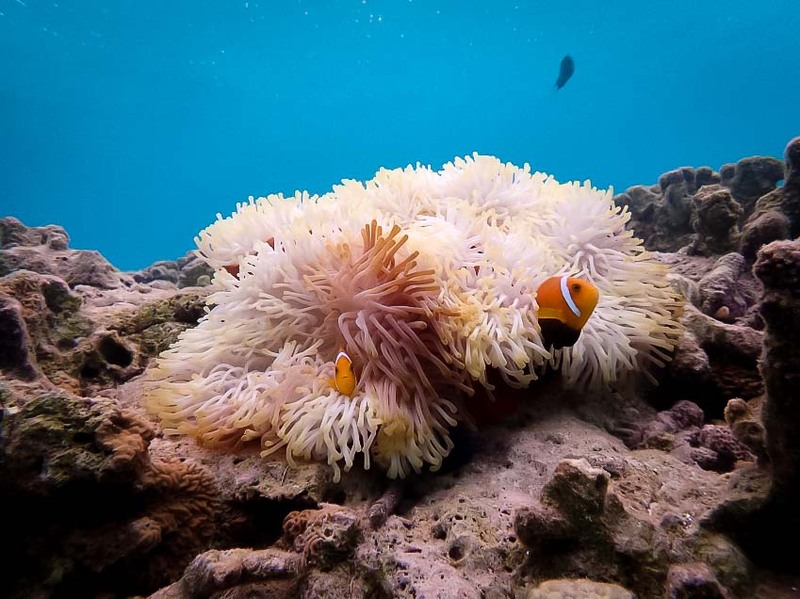 Each year at the end of the ‘dry’ North East monsoon, the Maldives archipelago experiences an increase in sea surface temperatures and the effects of this can be observed on the coral reefs. Each year we expect to see some paling in colour of the corals and even a little bleaching, with some colonies turning completely white. 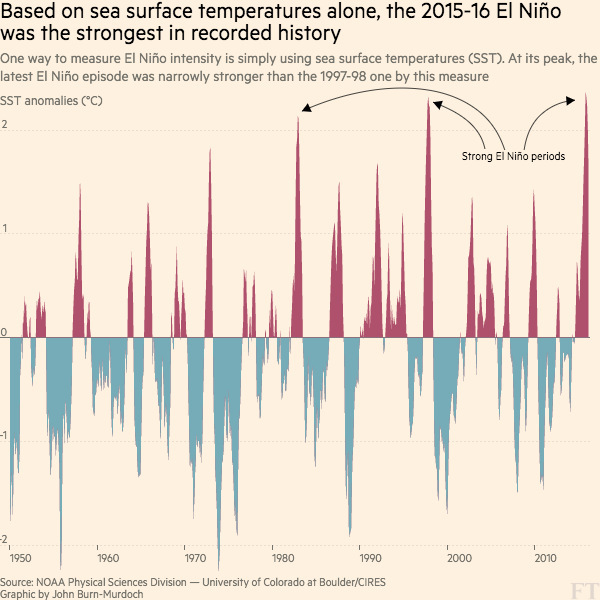 However, the sea surface temperatures during 2016 have reached a new high of approximately 34C. This unusually high temperature is due in part to the El Niño in the Pacific Ocean. 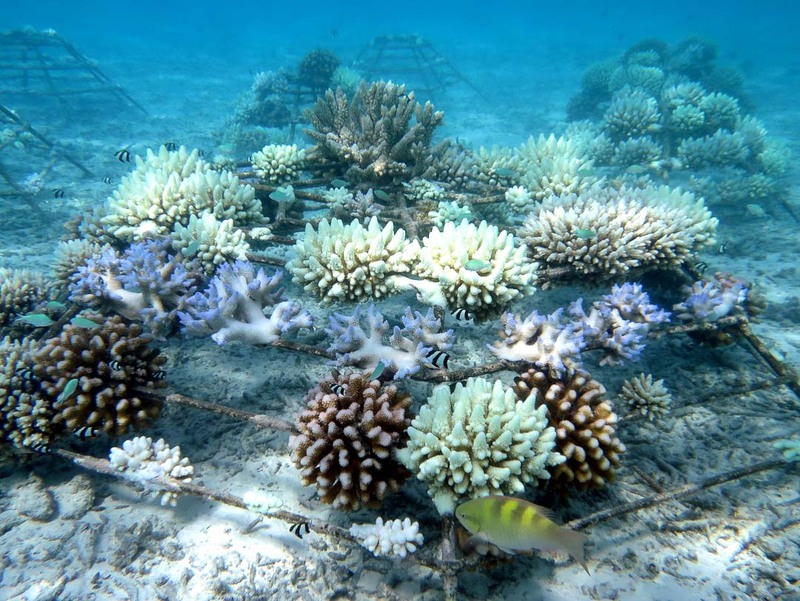 The last major El Niño event was documented in 1998, which resulted in the approximate death of 95% of the coral in the Maldives. It is predicted that the event this year could cause as much damage, and maybe more. Our Reefscapers Coral Reef Restoration programme provides us with an opportunity to actively select fragments from coral colonies that are more resilient to the effects of temperature change. We have implemented monitoring of the bleaching on a weekly basis, and have already seen distinct variation in resilience between sites as well as species and frame age. Many frames like KH1124, located in our shallow Turtle site, have shown noticeable paling. These photos show the comparison between the last monitoring (24 December 2015) and 9 April 2016. Unfortunately conditions are expected to worsen over the coming weeks, however, we hope that these species will recover in time. It is important for us to recognise the significance of this fragile ecosystem and the part we play in these unprecedented variations in climate. 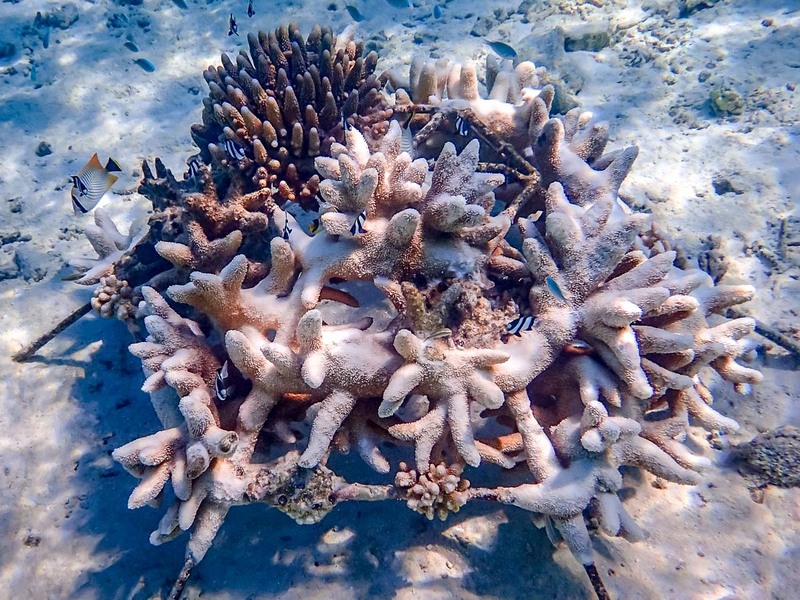 Coral reefs are essential to the survival of thousands of species and without them we will see detrimental trends in species diversity and abundance, as well as consequential effects to tourism and fishing sectors that many countries like the Maldives rely on. 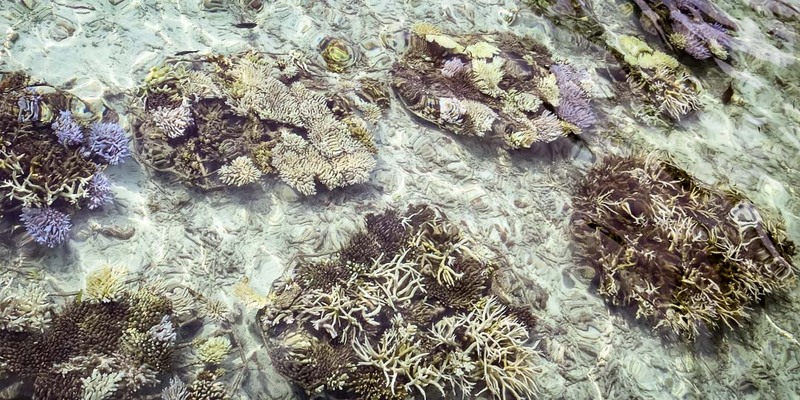 We are continuing to experiment with new solutions to limit coral mortality. Monitoring of all newly transplanted coral fragments will be done every two weeks to assess the success of the different techniques. Less Light Input – retransplanting coral fragments on the lower frame bars. 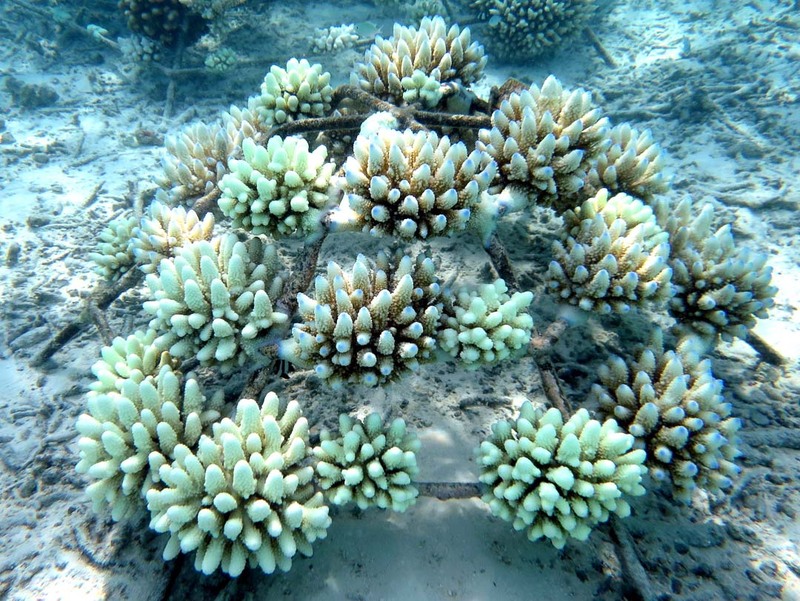 Calcium Carbonate Substrate – fixing coral fragments directly on old dead colonies. Reduced Total Sunlight – placing frames in shaded waters (under the dive jetty). 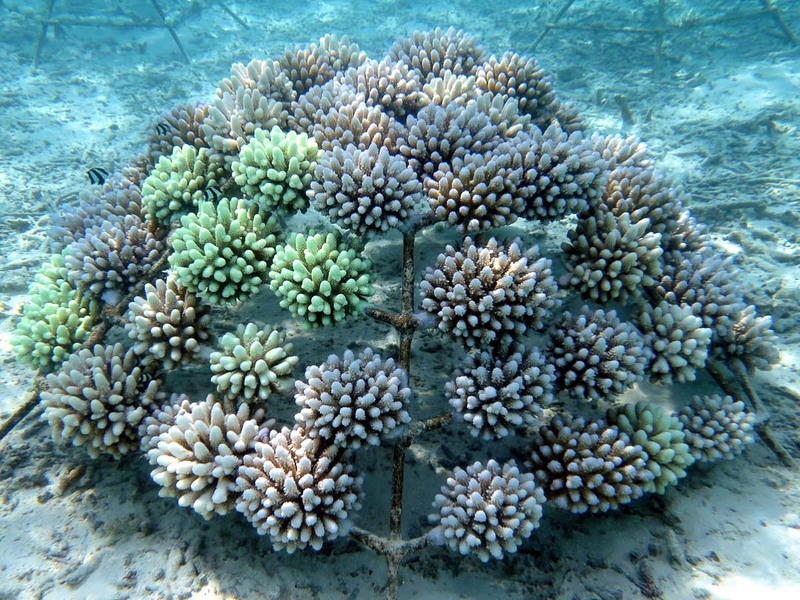 Coral Diversity – new/unusual species will be used (especially ‘massive’ corals) and closely monitored. Tank Experiments – coral fragments of different species will be tested under varying environmental conditions (water temperature, acidity). 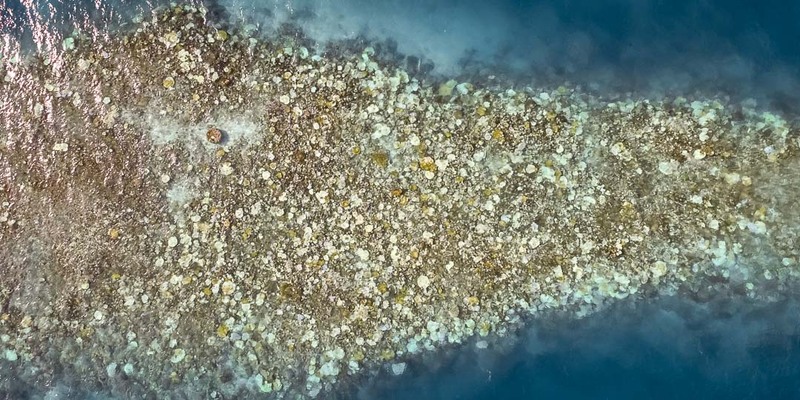 Coral Fragment Storage – coral fragments stored in external seawater tanks for several days. Bleaching Monitoring – twenty frames have been selected in different sites (different environmental conditions) for weekly monitoring and temperature recording. Frame Relocation – some frames moved to deeper holes in the lagoon (created by sand pumping). We will compare growth and changes in these frames compared to the original site. 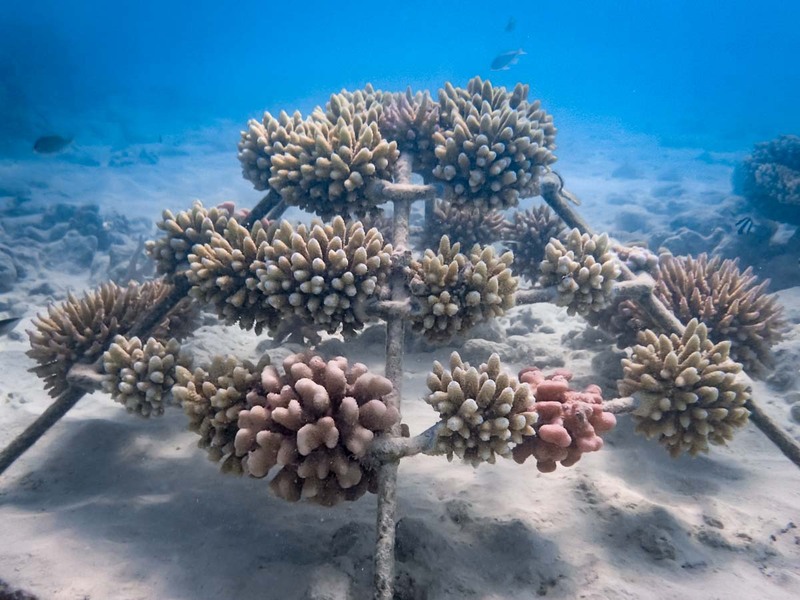 The annual rise of sea temperatures following the end of the NE Monsoon season has had a dramatic effect on both wild and artificial coral colonies at all sites. Evidence of coral bleaching was first noticed in our shallow lagoon sites during mid-March, and we started documenting the changes at our established coral sites. We deployed data loggers in the lagoon, which have been recording sea surface temperatures at the rate of six readings per day for the last five months. This provides reliable data to assess changing trends in temperature over this major El Niño climate event. We have seen a gradual increase in temperatures from month to month, even prior to the predicted ‘start date’ of the El Niño. March had a variable range in temperatures, but during April the temperatures frequently remained above 31°C. Peaks in the average daily temperature of 31.8°C were recorded on 2 and 15 April, and we saw surface temperatures of 33°C-34°C on many dives during the month. 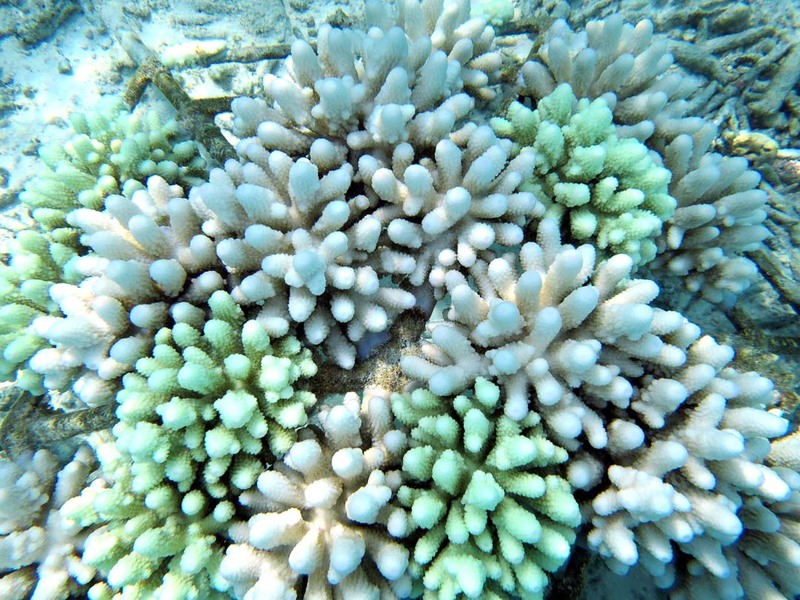 By the end of April, many coral colonies showed significant bleaching. Species including Acropora hemprichii and the brown morph of Acropora humulis were the first to show signs of paling. Interestingly, species that are infrequently used due to their fragility, such as Montipora folisa and Montipora digitata, displayed no morphological change throughout April. We have documented how adjacent coral colonies on our frames can show considerable variation in both the severity and rate of bleaching. Colonies of Acropora digitifera clearly showed this, and it will be interesting to see if colonies like these will also recover at different rates. 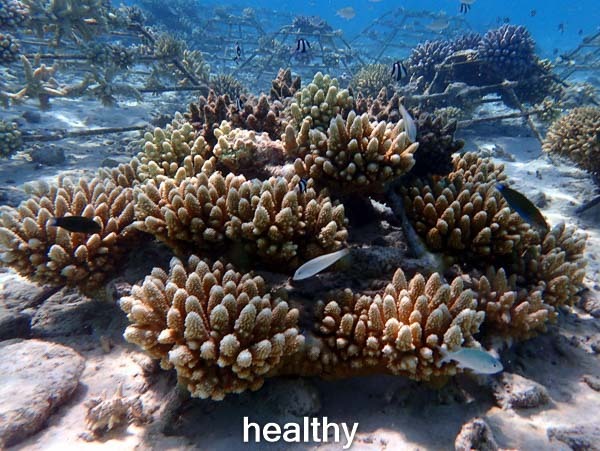 Frames located in very shallow waters (<2m) are particularly susceptible to coral bleaching, as the water tends to be warmer and exposure to sunlight is far greater. 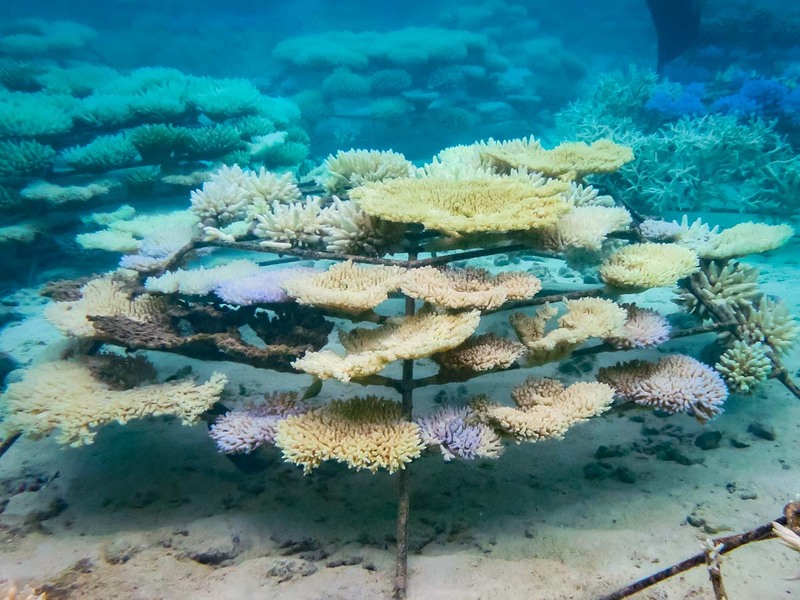 Corals thrive in a narrow range of sea surface temperatures, typically up to 29˚C; but temperatures were seen to reach 34˚C at some sites during April this year, severely stressing the corals on both our frames and the natural reef. At the start of the year, 12 large frames were deployed at ‘Vava Reef’, a new and relatively deep site (7m) with a high abundance of reef fish and seemingly optimal environmental conditions for coral survival (exposed site with good currents and cooler water). 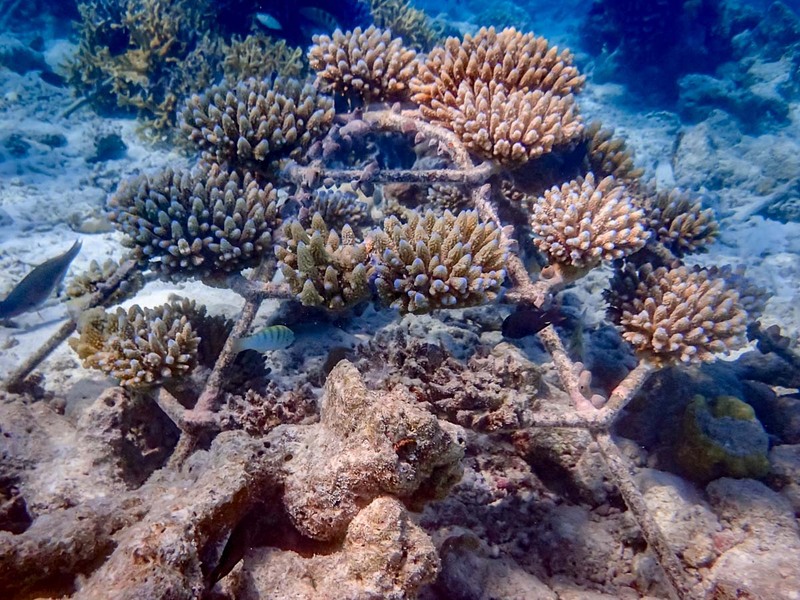 However, even the frames at this site have been affected, with most of the newly- transplanted coral fragments now bleached, and Pocillopora already showing signs of partial mortality. We will be monitoring this site during the coming months, to closely follow the evolution of the frames. By the end of April, most of the corals on both our propagation frames and the natural reef are considered bleached, down to depths of 25m. 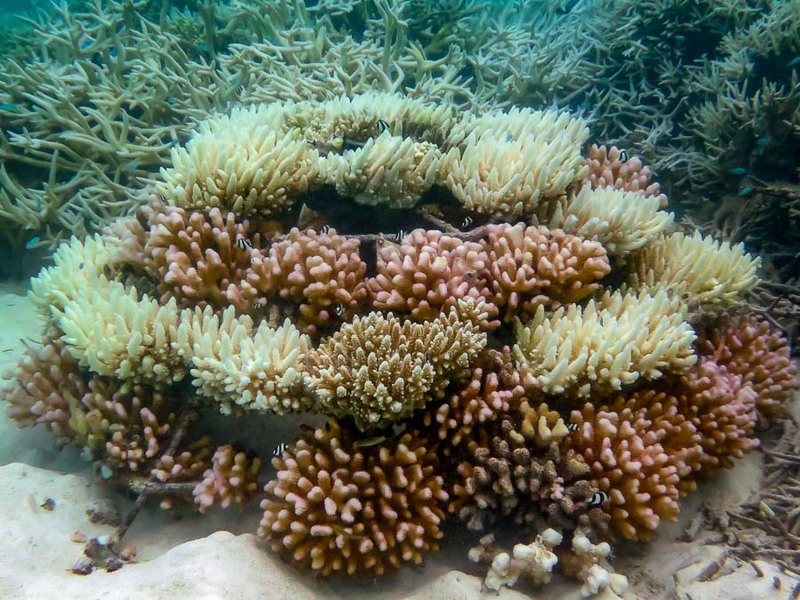 Corals that remain white in appearance are bleached but still have a chance of recovery should the sea temperatures return to normal over the coming weeks. All the species in our shallower sites look completely white, whereas we have identified some Acropora humilis on deeper water frames (4m to 13m) that have kept some of their purple colouration (a good indicator-species, to track the bleaching progression of our reefs). Some colonies may be genetically superior in surviving the high temperatures, however continued monitoring has shown the inevitable loss in colour, with many colonies starting to get covered in a thin layer of algae. 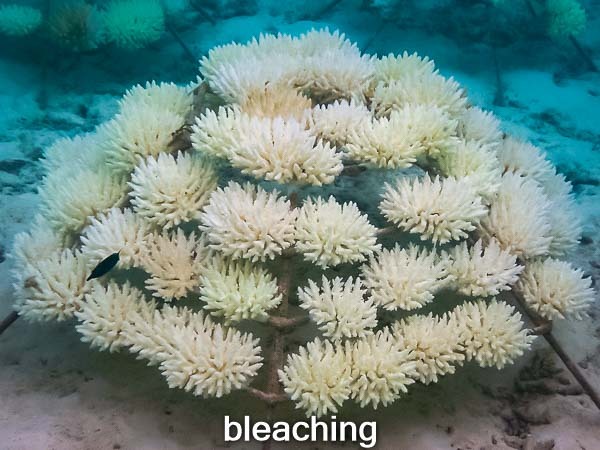 Although bleaching has been intensively studied in corals, little is known about the causes and consequences of bleaching in other tropical symbiotic organisms. 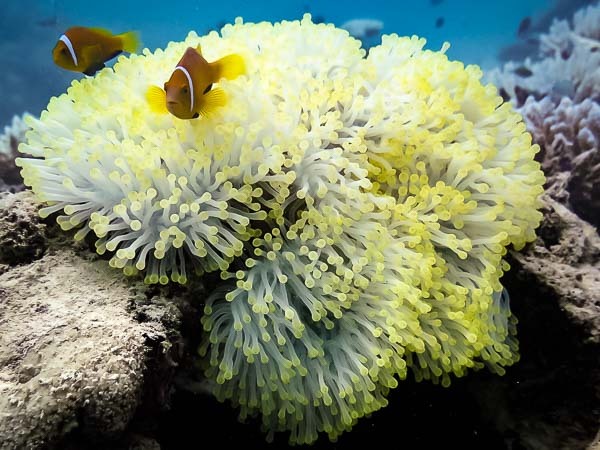 Much like their coral cousins, anemones also rely heavily on the presence of microscopic algae called zooxanthellae. We have since seen a reduction in overall size of each anemone monitored, as well as the shrinking and shortening of individual tentacles. 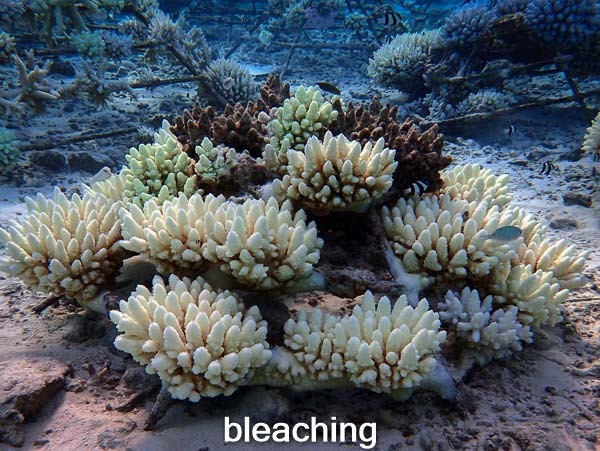 Hobbs (2013) found a reduction in mass of 34% of anemones after a bleaching event in Papua New Guinea (2009). Our weekly monitoring throughout May saw a demise in coral health across all our restoration sites. There was significant growth of algae, most noticeably on branching coral species such as Acropora muricata and Acropora humilis. By mid-May, we also started to observe bleaching in our deeper frames (4m to 13m). A condition termed ‘White Syndrome’ has affected many colonies. This disease refers to the inconsistent colouration within a single colony – turning from its vibrant colour to white in a patchy manner or often with a distinct line between the affected and unaffected areas. We have observed this only in the purple morph of A.humilis, however, this may only be as a result of how marked this colour change is during bleaching. Kuehl (2011) concluded that increases in both temperature and light intensity had a substantial effect on the presence and severity of ‘black band disease’, particularly when temperatures increased from 26 to 30 degrees. 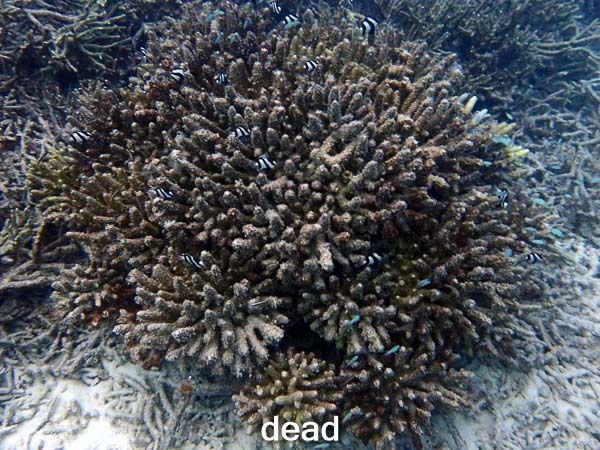 (More illustrated details on our Coral Diseases page). Hobbs, J., Frisch, A., Ford, B., Thums, M., Saenz-Agudelo, P., Furby, K., Berumen, M. (2013). Taxonomic, Spatial and Temporal Patterns of Bleaching in Anemones Inhabited by Anemonefishes. Plos One. Kuehl, K., Jones, R., Gibbs, D., Richardson, L. (2011). The roles of temperature and light in black band disease (BBD) progression on corals of the genus Diploria in Bermuda. Journal of Invertebrate Pathology. 106(3), 366-370. 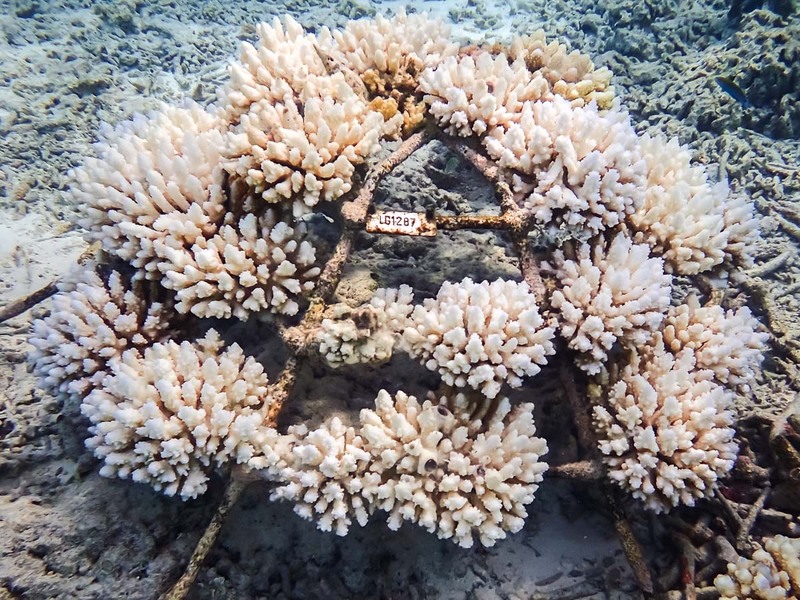 Following the bleaching event, we are now observing extensive algal overgrowth on many of our coral frames as well as the natural island reefs, even down to depths of 25m. 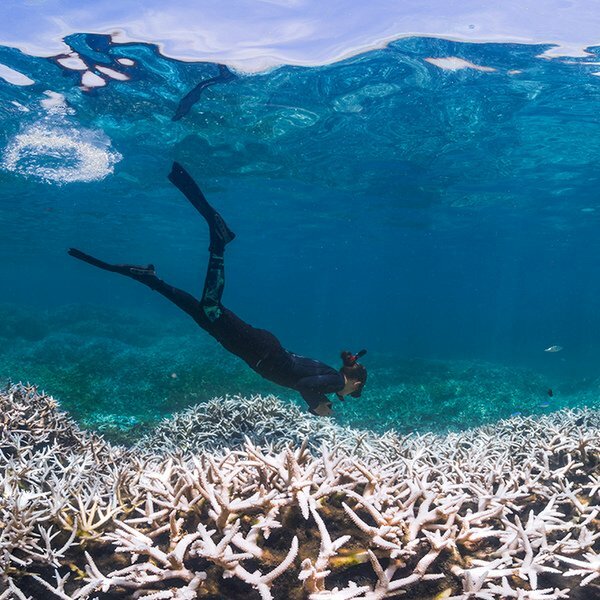 This is similar to the conditions observed in 1998, during which bleaching caused 90% of mortality of the Maldivian coral reefs across all species. 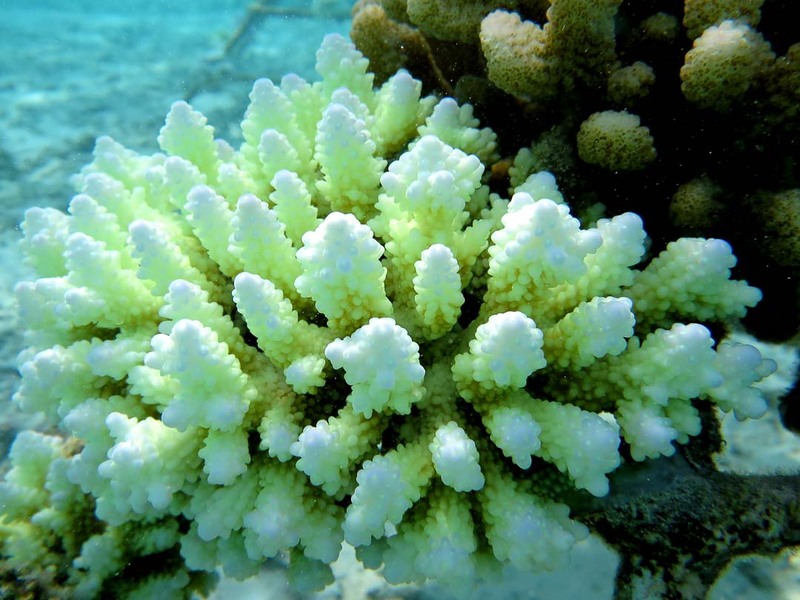 More than 90% of our coral frames have been severely affected, across all generations of frames, although Pocillopora species have shown some resistance to the bleaching, along with Porites cylindrica, Montipora foliosa and Psammocora sp. We are cleaning partially-dead coral colonies of any debris and algae to aid their recovery and increase the chances of survival for the living sections. The dislodged healthy fragments allow for some opportunistic re-transplantation onto other frames. A total of eight frames have been fully or partially re-transplanted with a total of 120 fragments (Acropora latistella, Montipora digitata, Pocillopora verrucosa, Porites cylindrica, Pocillopora elegans), and we will be closely monitoring their progress over the coming months. We have also taken fragments and small colonies of various species (Pocillopora damicornis, Montipora foliosa, Psammocora sp.) 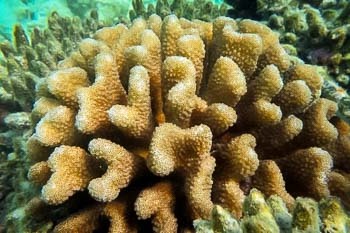 and nestled them into branches of dead digitate corals for them to encrust onto and grow over. 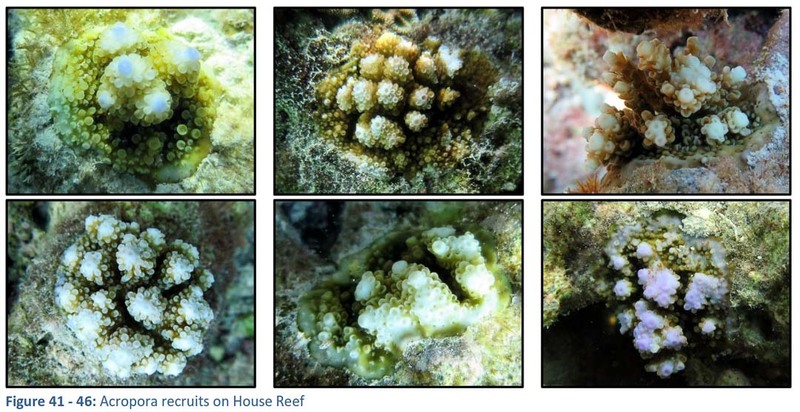 Live coral coverage on the natural house reef is estimated to be less than 10%, due in part to the ‘massive’ growth forms of Porites, Favia, Diploastrea heliopora and other species. 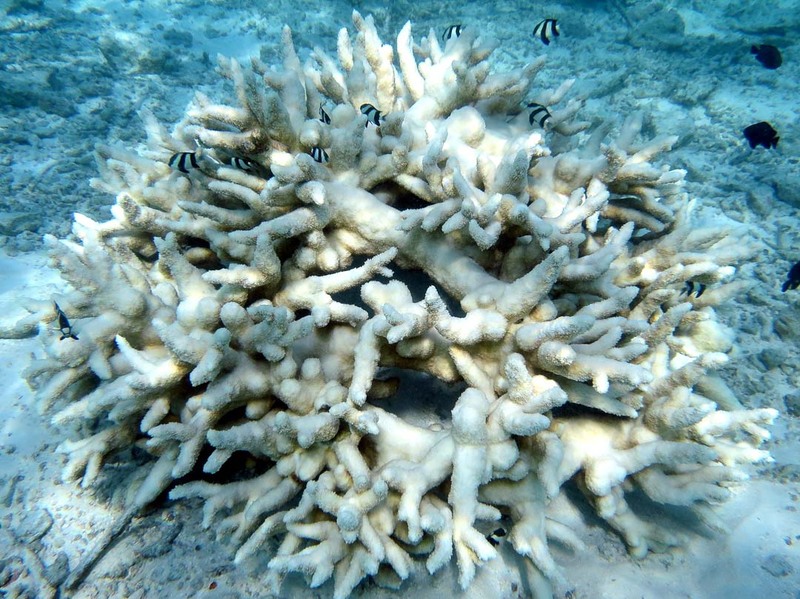 We are continuing to make assessments to better document the extent of coral bleaching damage. Interestingly, some coral frames with dead and algal-covered Pocillopora verrucosa on the topside are showing healthy and colourful undersides. 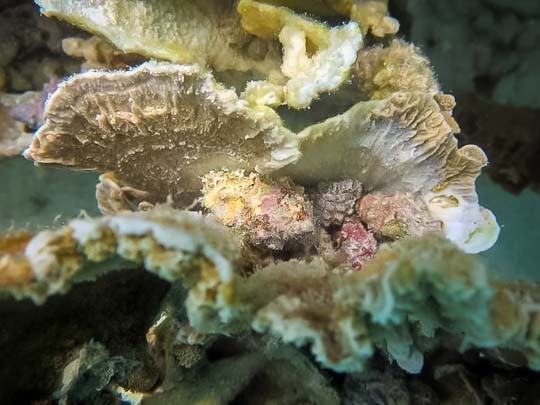 Surviving corals (mainly Montipora digitata, Monitpora foliosa, Acropora latistella) are now being inundated with Drupella cornus and Drupella rugose, with hundreds of individual snails in single coral colonies both on our frames and the natural reefs. Removing these damaging corallivorous Drupella is now essential for the long-term health of the reefs. Outbreaks are common after a bleaching event, and in just 10 days we removed over 8000 snails, ranging in length from 0.4 – 4.5cm. At Landaa Giraavaru, we have started to transplant our new frames mainly with the survivor species Pocillopora (mainly P. verrucosa and P. meandrina) and Favites halicora colonies found in our house reef. Some Porites Rus were also transplanted, along with Montipora digitata (sent from Kuda Huraa, as this species is not found around Landaa), but with mixed success rates. During July and August, we have surveyed over five hundred coral frames around the island across 11 different sites, totalling more than 25,000 coral colonies. 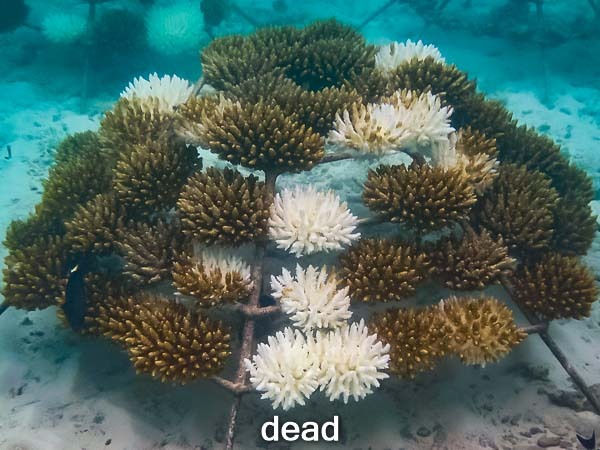 Only 1% of those colonies were found to be alive, mainly Pocillopora species and some bleached Acropora (now likely dead). Our results show that 100% of the fragments transplanted less than 6 months ago had died, suggesting future coral frames should not be transplanted before predicted sea temperature rises. 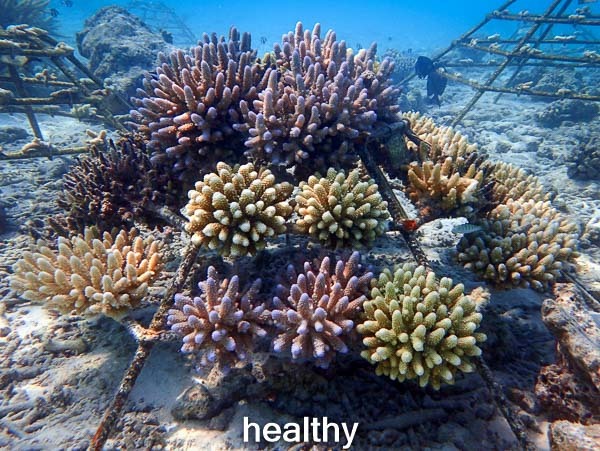 No significant mortality differences were found between different depths overall, however, Pocillopora species seemed to survive better in shallow depths and Acropora species at greater depths. From studying our shallow water temperature logger data, the Sea Surface Temperature (SST) during 2016 can be seen to be higher than previous years, with average water temperatures during May reaching 31˚C. 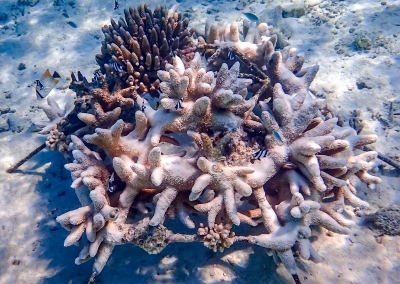 At Kuda Huraa, re-transplantation efforts have continued throughout July and August, although much higher mortality rates have been seen (above the typical 10-20% rate) due to the recent bleaching stress of the new coral fragments. 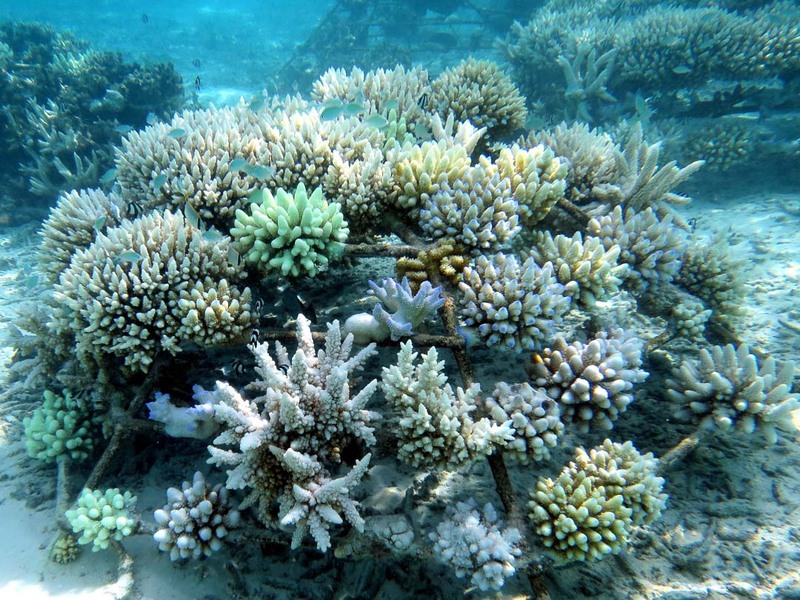 We can expect the survivability of re-transplanted coral fragments to improve over the upcoming months, and we will be using the coral species that showed most resilience throughout the bleaching event (Porites cylindrica and Montipora digitata) plus Pocillopora verrucosa to ensure diversity and minimise stress on donor colonies. Interestingly, we have also spotted small Pocillopora damicornis colonies growing in the corners of some coral frames – a promising sign to see these new recruits arriving and spreading naturally. 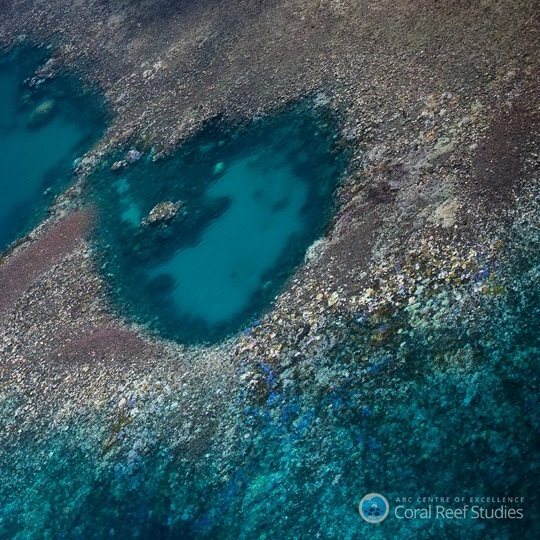 To gather an accurate assessment of the coral mortality on the natural house reef, five replicate 50m Point-Intersect Transects were conducted along the reef crest at depths of 2-3m. 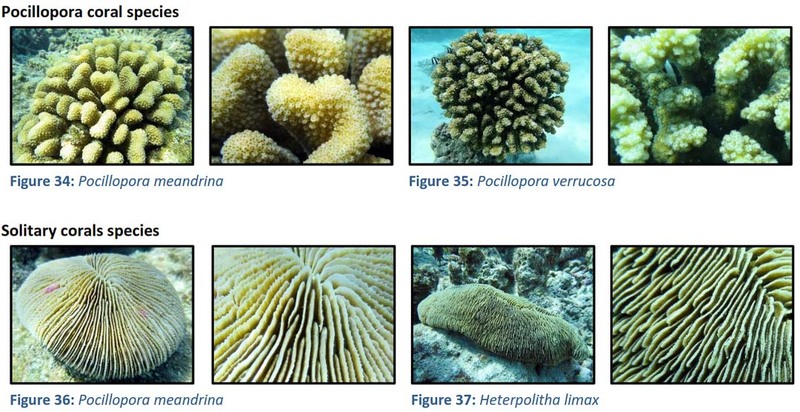 Each transect generated 100 points and the following categories were used to determine the substrate type: live coral, dead coral, soft coral, macro algae, turf algae, rubble and sand. 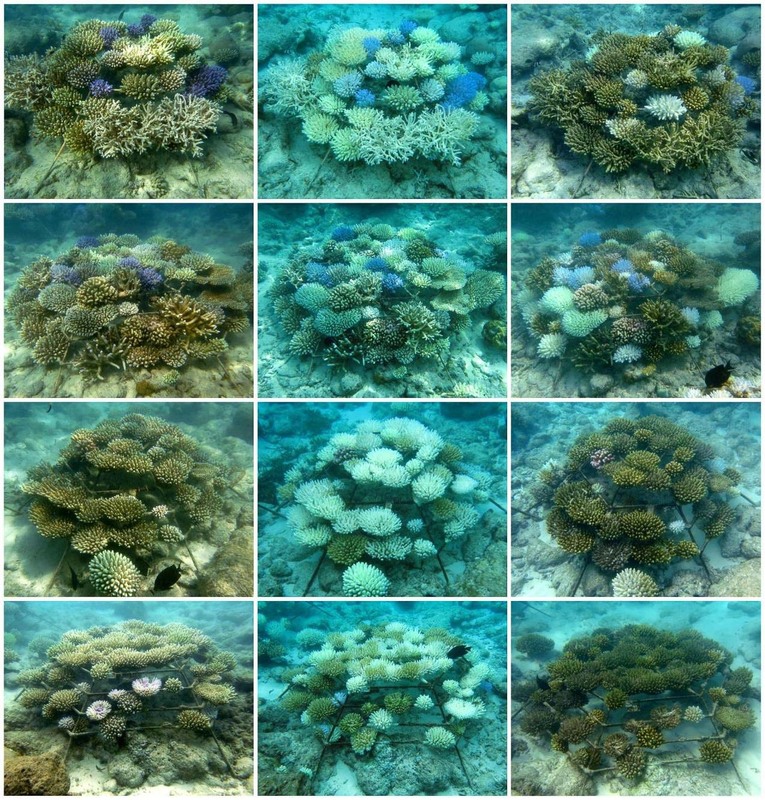 On the House Reef there is only 7% (SE±0.6%) live coral remaining. 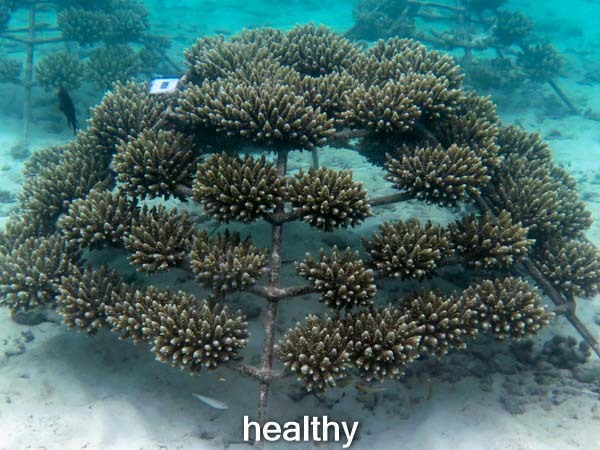 On our coral frames, the lowest mortality (89%) was seen on the oldest frames, with the youngest one year frames showing 100% mortality (which is to be expected as small coral fragments are more susceptible to stress). Acropora latistella, Porites cylindrica, P. verrucosa, Montipora digitate, M. foliosa. 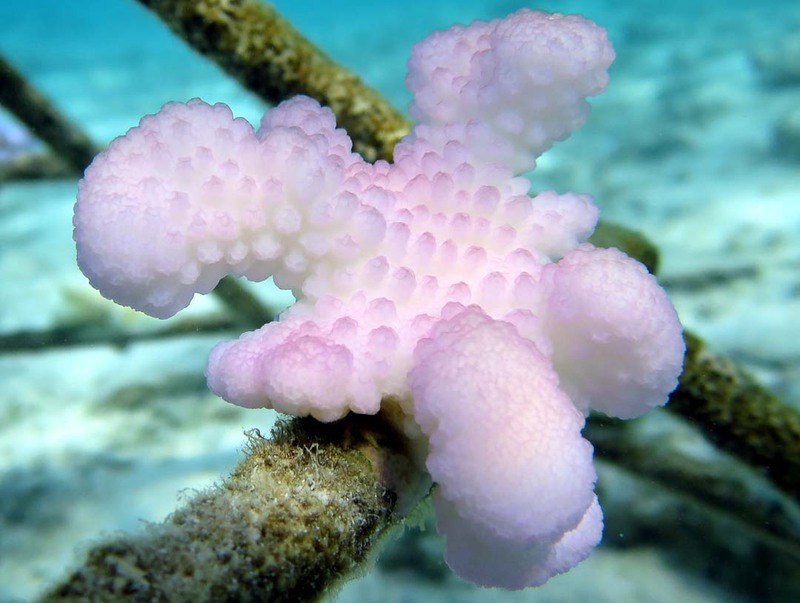 The Montipora genus makes up the largest percentage of surviving colonies (58%) and Acropora the smallest (2%). In August, we noticed significant improvements in the condition of our anemones around the island. 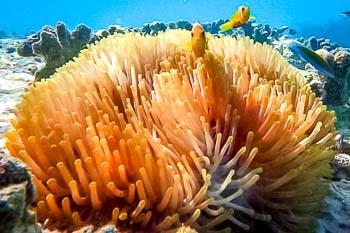 The distinctive patch of darker tentacles at the front of the anemone is an indication the zooxanthellae are returning. Throughout July and August we continued to remove large numbers of Drupella snails (D. rugose, D. cornus) from our coral frames and the natural reef. In areas of high coral coverage these corallivores have been found to feed on over 25 species of corals worldwide, with damage ranging from minor to lethal. Before the bleaching event, the Drupella snails were much less of a problem; Al-Horan (2011) concludes that increased sea water temperature positively correlates to the feeding rate of Drupella. 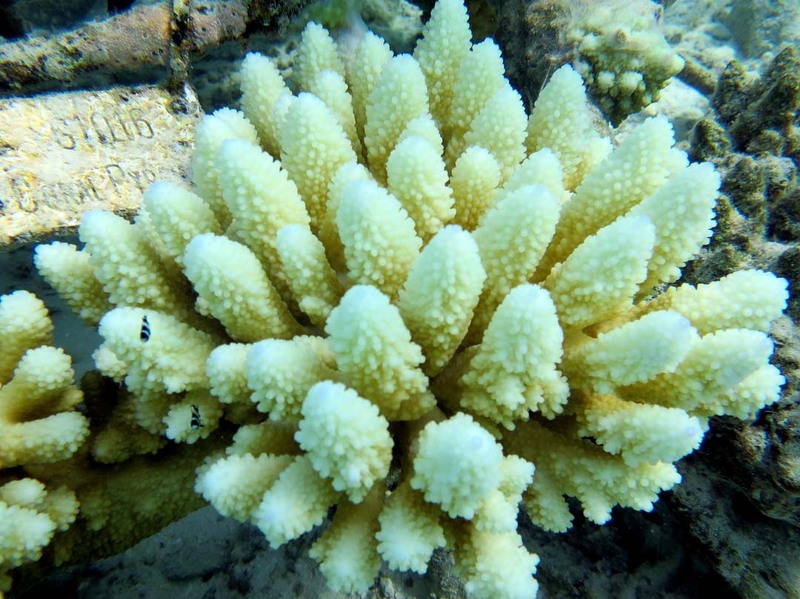 Before the bleaching event, Drupella were found on the reefs sporadically, mainly on Acropora species. 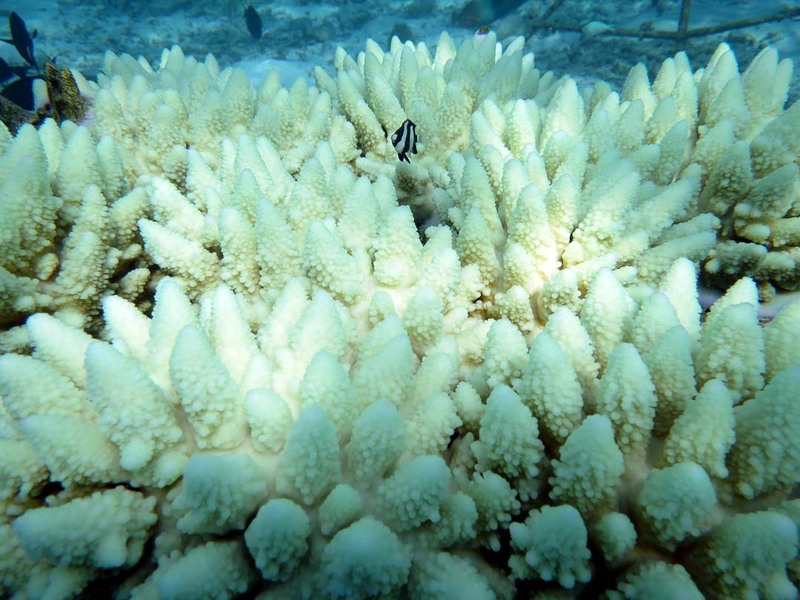 However, Acropora had low resilience against the bleaching event, and so the snails have actively changed their feeding habits to exploit the changing coral availability (Hoeksema, 2013). 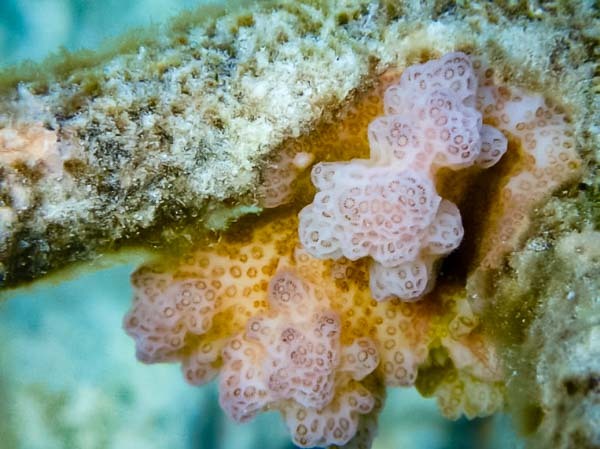 We have documented this trend at our Channel site where Montipora foliosa has been persistently targeted since the end of the bleaching event. Despite being healthy at the end of May, many of these mature targeted colonies have since succumbed and now show total mortality despite snails not being found all over the colony. Meesters (1994) concluded that this was due to the energy-intensive process of regeneration and repair after an attack. This can have consequential impacts on unharmed neighbouring polyps leading to weakened fitness for the colony as a whole (Rotjan, 2008). Baird (1999) hypothesised that these weakened colonies act as an attractant for Drupella to further colonise the area. His research found that D. rugosa preferentially selected damaged over undamaged colonies. This is a behaviour we observed, whereby a single frame would be removed from the water to have large numbers of Drupella plucked from it, only for the same numbers of snails to be found again on the same frame only 24 hours later. 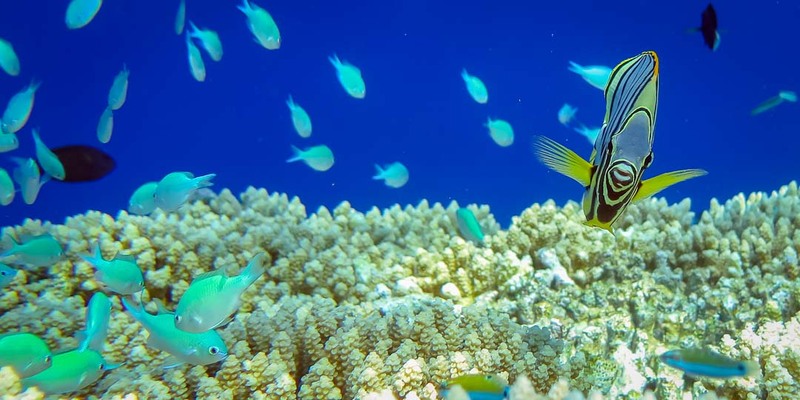 There is debate whether the presence of disease on a coral colony attracts predators like Drupella snails or if the Drupella weaken the structural integrity of the polyps allowing entry wounds for infection. Nicolet (2013) found that Drupella was a highly effective vector of brown band disease, infecting more than 40% of experimental colonies. This supports the hypothesis that the pathogen invades coral tissue that was previously compromised. Rosenberg (2012) suggested the increase in coral diseases following an increase in sea surface temperatures could be due to: (a) the host being more sensitive to the pathogen, (b) the virulence of the pathogen being increased, (c) an increased frequency of transmission through a vector (or a combination of all three). 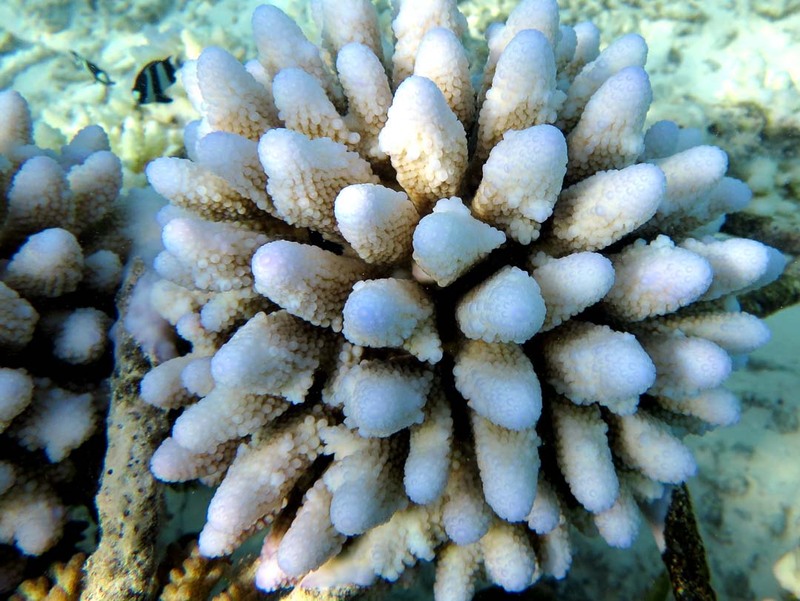 In the two surviving Pocillopora species (P. verrucosa and P. damicornis) we have observed rapid tissue necrosis (RTN), also known as ‘white patch’. 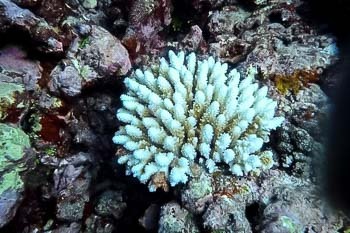 The tissue is observed to peel off the coral skeleton over 12-24 hours, resulting in complete mortality. RTN has been found to be caused by the presence of bacteria (Vibrio species) in the tissue of the corals (Luna, 2007). 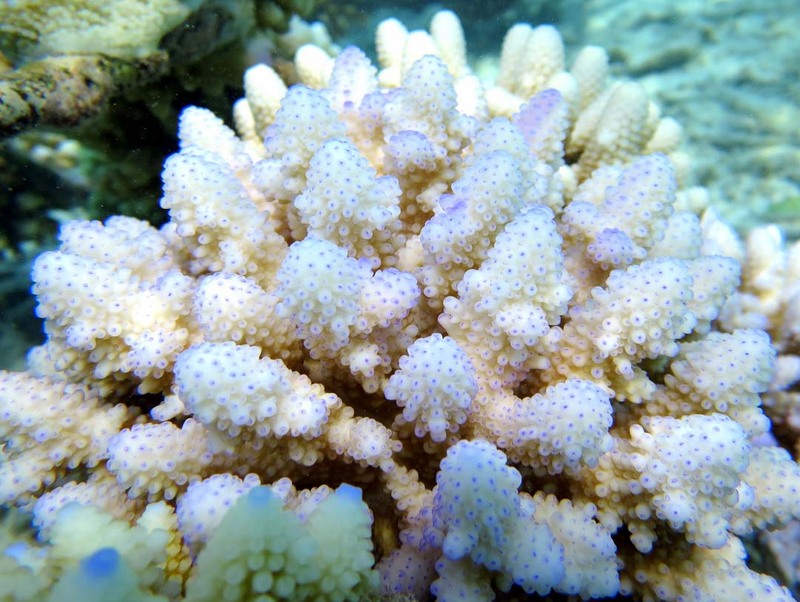 Acropora latistella survived with mixed success throughout the El Nino event, with many colonies showing signs of continued resilience after temperatures had returned to cooler levels in June and July. 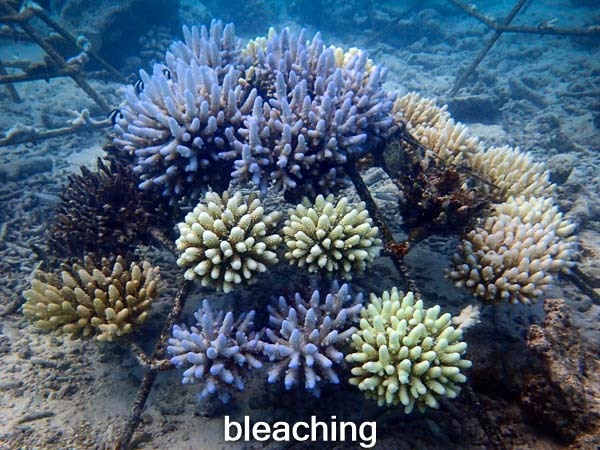 Throughout August, however, there seems to be secondary bleaching and coral death, most likely due to coral disease (RTN). 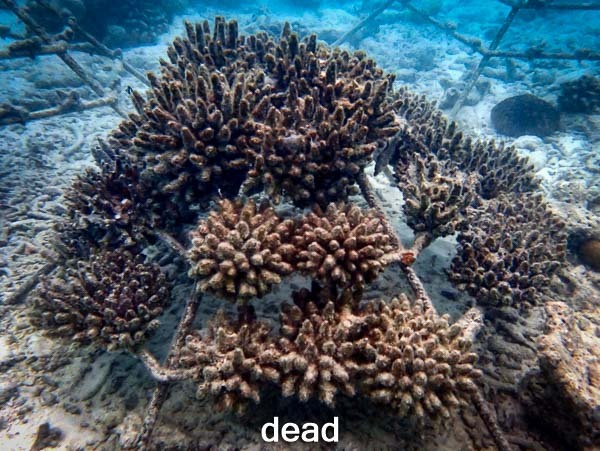 The evidence from recent scientific papers suggests that coral diseases are becoming more prevalent in recent years (particularly at elevated seawater temperatures) because the corals are less able to fight off the disease while under temperature stress (Harvell, 2007). Al-Horan, F. et al (2011) – Prey Selection and Feeding Rates of Drupella cornus. Jordan Journal of Biological Sciences. 4, p191-198. Baird, A. 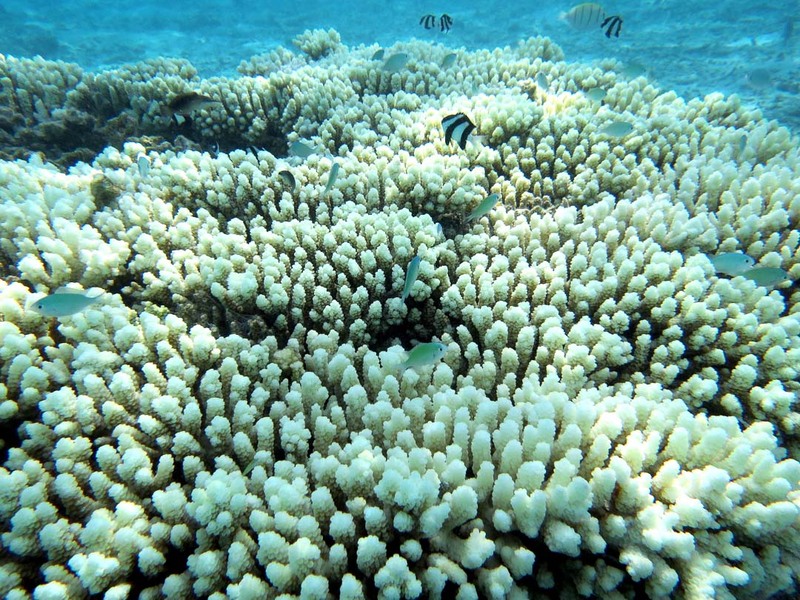 (1999) – Aggregation Of Drupella rugosa Following Mass Bleaching Of Corals On The Great Barrier Reef. Reef Research. 9, p6-7. 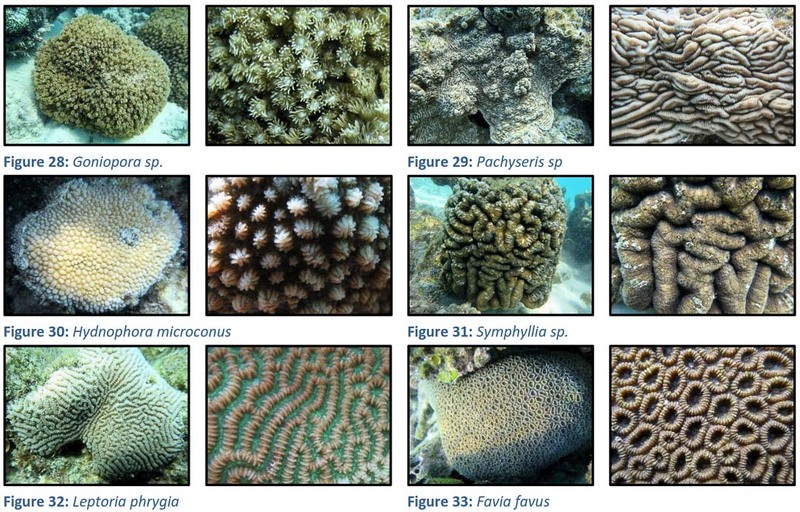 Harvell, D. et al (2007) – Coral Disease, Environmental Drivers, Between Coral & Microbial Balance. Oceanography, 20, p172-195. Hoeksema, B. et al (2013) – Dietary Shift In Corallivorous Drupella Snails Following A Bleaching Event In Thailand. Coral Reefs. 32, p423. Luna, G.M. 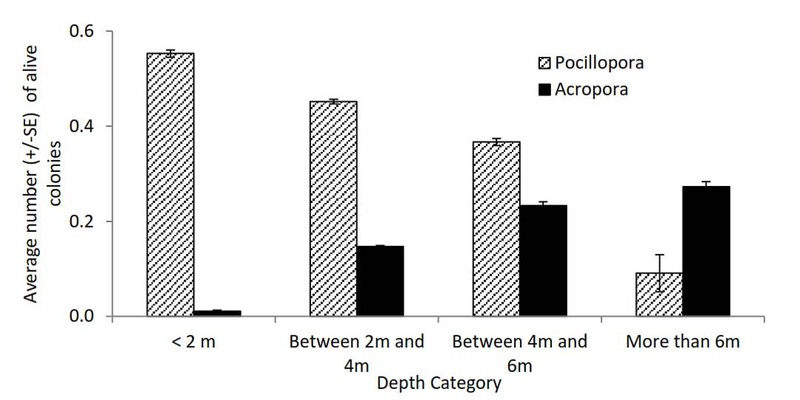 et al (2007) – Bacteria Associated With The Rapid Tissue Necrosis Of Stony Corals. Environmental Microbiology. 9, p1851-1857. 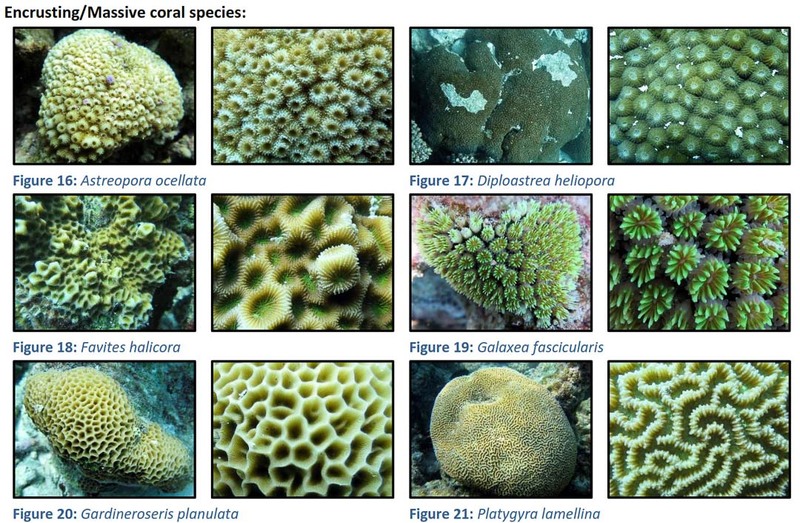 Meesters, E. et al (1994) – Links To Growth In The Reef- Building Coral Montastrea annularis. Marine Ecology Progress. 112, p119–128. 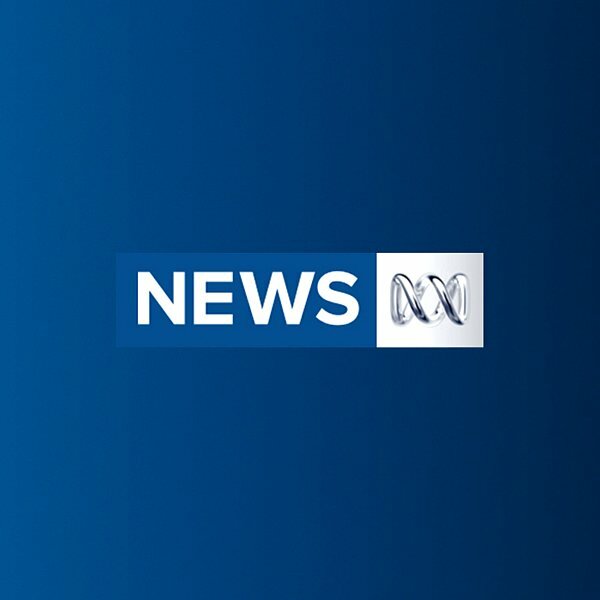 Nicolet, K. et al (2013) – Drupella Aids In The Transmission Of Brown Band Disease On The Great Barrier Reef. Coral Reefs. 32, p585-595. 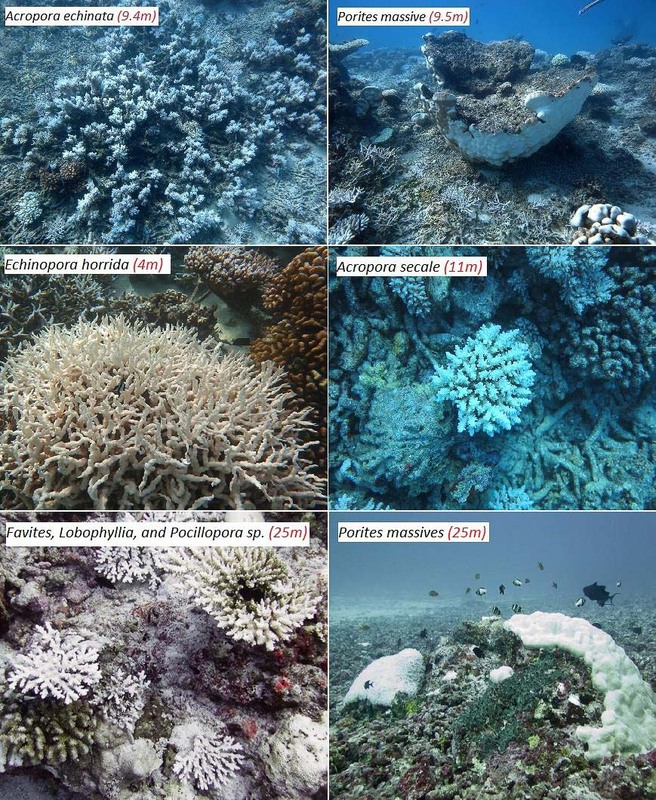 Rosenburg, E. et al (2002) – Microbial Diseases Of Corals And Global Warming. Environmental Microbiology. 4, p318-326. Rotjan, R., Lewis, S. (2008) – Impact Of Coral Predators On Tropical Reefs. Marine Ecology Progress Series. 367, p73-91. Following the coral bleaching events earlier in the year, our re-transplantation efforts are continuing to rebuild the reefs around Kuda Huraa. During September, 675 frames were monitored at the House Reef site, and a further 50 frames (with 1300 new coral fragments) were re-transplanted to the channel site. We are using the main species that remain the most abundant living corals after the bleaching event: Pocillopora verrucosa, Pocillopora meandrina, and some Montipora digitate. Some bleached (not dead) colonies of Acropora latistella have been sighted around the island, so we are also experimenting with these as a faster growing species. Last month we started a new coral regrowth experiment, to investigate the growth potential of Montipora digitata and Psammocora obtusangula fragments when simply placed amongst dead digitate corals. The progress of the coral fragments will be monitored weekly, and if successful, this method could be used to recolonise our mature bleached frames (eliminating the need to remove the existing dead colonies and attach fragments). 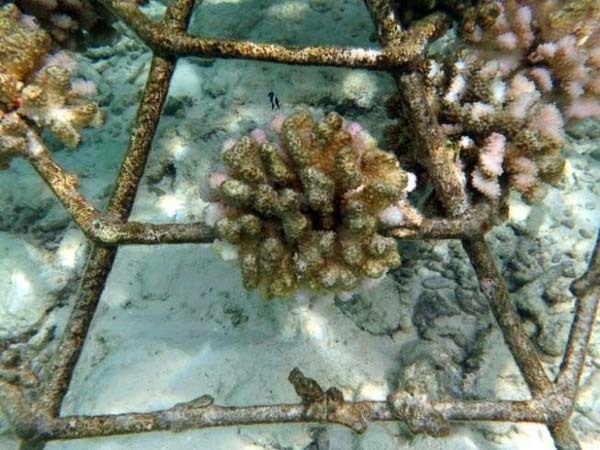 At Landaa Giraavaru, 37 new coral frames were transplanted in September, and a further 75 frames were recycled. All the frames were located at our new Parrot Reef site, which now totals 189 frames. 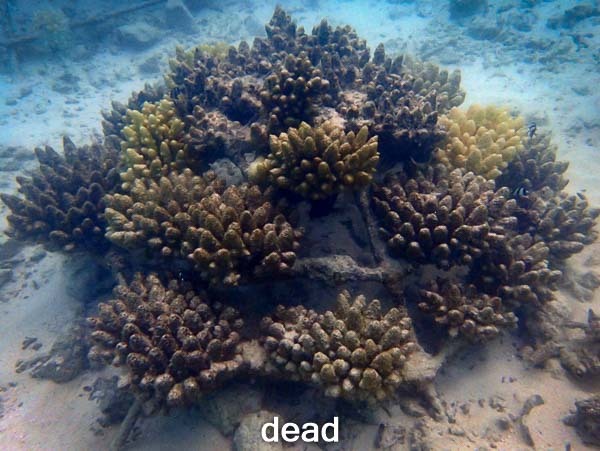 Most frames were transplanted with the survivor Pocillopora species (mainly P. verrucosa and P. meandrina), with an encouragingly low 10% mortality observed. We have tried to transplant some surviving Acropora colonies but without success. A total of 743 frames were monitored (photographed and cleaned) during September, mainly across 3 sites: Coral Trail, Landaa Estate and Dive Site. 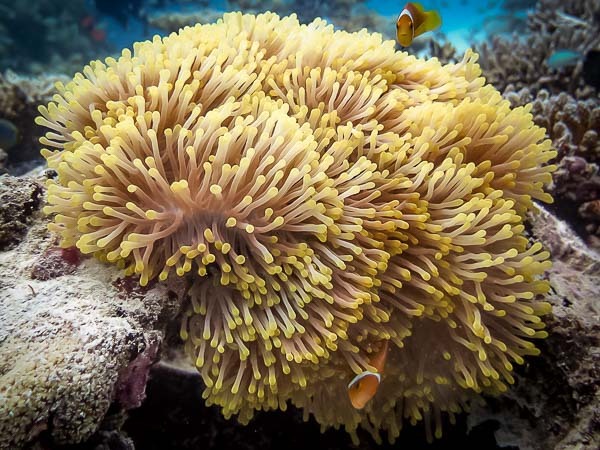 We have seen significant improvements in anemones – as the zooxanthellae return, so does the characteristic darkened colouration of the anemone. 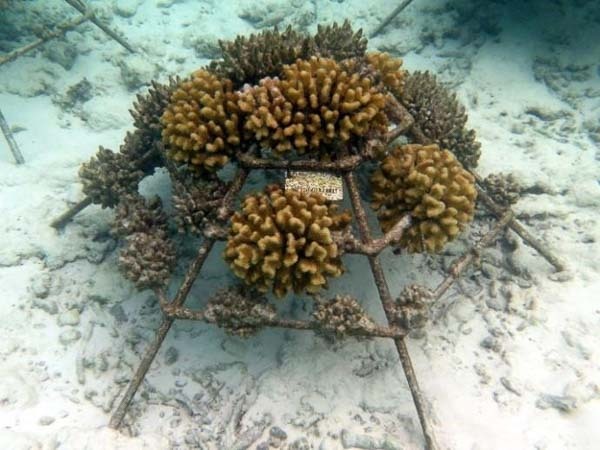 At Kuda Huraa, a total of 25 coral frames were transplanted during October-November, and deployed at various depths on the house reef to compare survival rates. We are observing 90% survival rates for frames at 8m-12m, compared with the 2m-4m frames which are suffering from Drupella snail predation. Of the 63 newly transplanted frames at our channel site, we have observed higher survival rates in frames placed initially on sand (possibly due to lower recruitment of Drupella and algae). We have also relocated 142 frames from the house reef, for re-transplanting to our channel site. Fragments of Acropora austera and Acropora tenuis have been collected from a nearby healthy reef and transplanted on a frame at the house reef. This frame is at a depth of 4m; no corals were placed on the bottom bars to discourage predation, and after 2 weeks we are seeing a 60% survival rate with no signs of Drupella. The natural reef flat on the sunrise side of Kuda Huraa is full of life, with certain corals such as Montipora digitata doing remarkably well. Coral recruits (Pocillopora and Acropora) are present near the crest, where water movement is created by waves and where the current is strong. 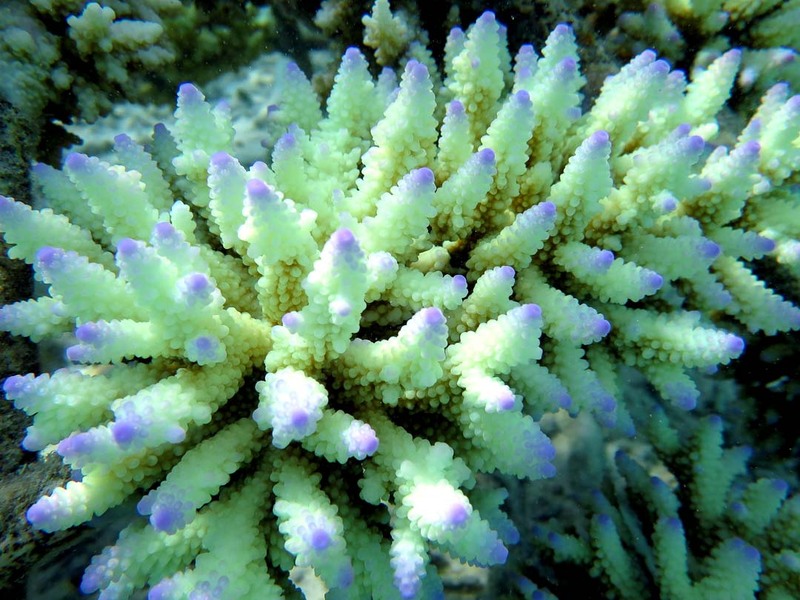 Live Acropora colonies and recruits can be seen on various dive sites around the island from a depth of 10m. Most of the 215 new coral frames built at Landaa Giraavaru during October-November were relocated to our new Parrot Reef site. 162 frames were re-cycled, with a further 53 new frames transplanted. We are using Pocillopora species of coral fragments as Acropora are still rare and live mostly at depths of 12m or more (unsuitable for our 5m frames). There is still a high biodiversity of corals on our House Reef. Most of the species are encrusting-type ‘massive corals’, but there are some ‘solitary coral’ and ‘soft coral’ varieties present on the reef. 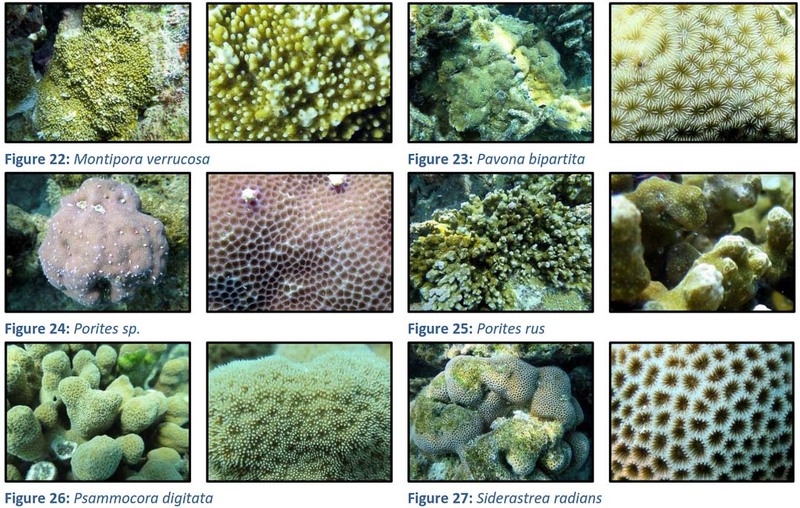 See below for a non-exhaustive illustrated list of the corals species living on the House Reef. – Sinularia notanda, Symphyllia sp. So far, we have only sighted 4 or 5 individual Acropora coral species growing on the House Reef that survived the coral bleaching event. However, we are pleased to observe many new healthy Acropora recruits of 3-4 cm in diameter, growing in shallow waters from 1m deep. Because of their small size, we are not able yet to identify them but we are certain that at least 5 different species are represented (below). At Landaa Giraavaru, we transplanted 21 new frames during December and a further 22 recycled frames (renewed following the bleaching event). All the frames were relocated at Parrot Reef (except the Xmas Tree) bringing the total to 420 frames at this site. Again, fragments of Pocillopora species were the only type of coral that we used, as Acropora species are rare after the coral bleaching event and live mostly beyond 12m deep. At Kuda Huraa, a total of 9 coral frames were sold during December, and we now have 145 frames that have been transplanted since the bleaching event earlier this year. 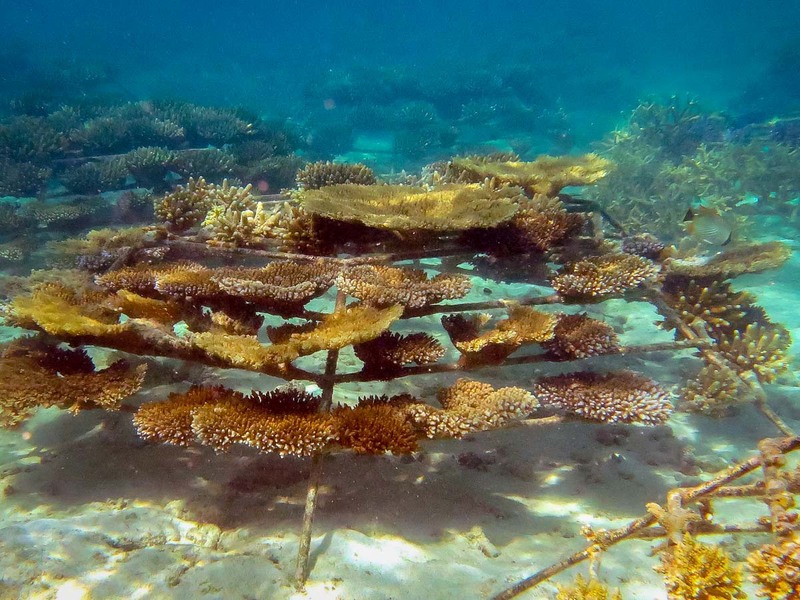 A further 54 coral frames were recycled, and placed in the Channel area on a sand substrate in order to reduce predation from Drupella snails. (Whilst largely snail-free, some tissue loss was observed on the newly transplanted frames due to sand covering the lower fragments). 7 frames were deployed at greater depths than usual (9m, at our House reef) to assess the effects of depth on coral frames after transplantation. After 2 months, most of the Pocillopora verrucosa coral fragments have recovered from their initial stress (fragments showing tissue loss did not recover). Recently, the marine biology team at Gili Lankanfushi kindly donated some Acropora corals to our Reefscapers Programme. During the bleaching event, the team were using coral lines and shading, which helped some coral fragments survive the elevated ocean temperatures. We attached these coral fragments to 10 frames; they bleached initially but have since regained colour. 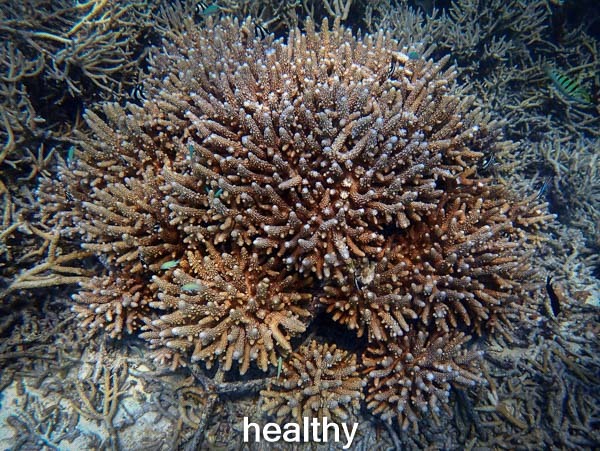 Acropora humilis has been doing well, whereas Acropora aspera has suffered from some algal overgrowth. 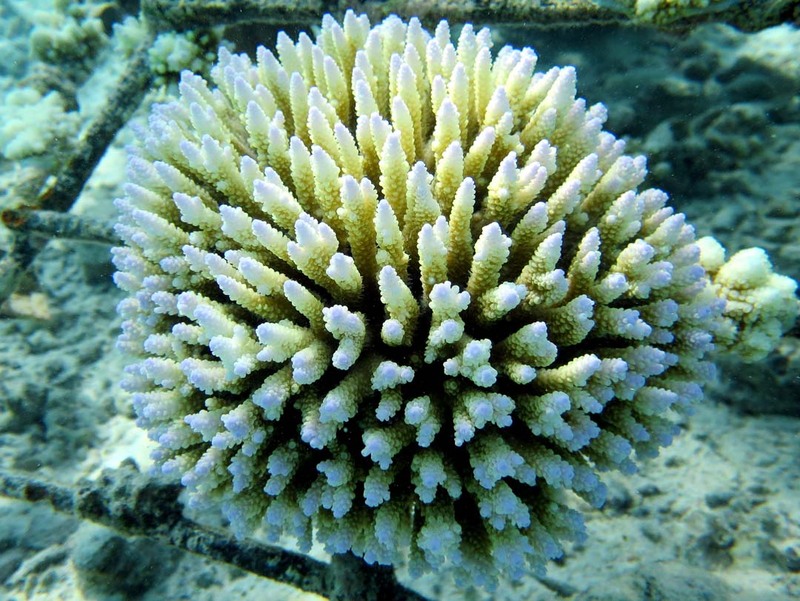 A coral growth study has been started this month. The experiment consists of placing micro-fragments of coral on a perspex sheet in order to see the growth of the micro fragments in 3D. Micro-fragments of both Pocillopora and Acropora were collected and 32 fragments (16 of each genus) were placed on the sheet. This experiment was conducted in the Channel area for easy access and regular monitoring. So far, the fragments have lost tissue or have bleached, perhaps due to sediment on the perspex sheet. Further attempts will be conducted with tweaks made to the methods in order to reduce stress on the fragments during manipulations and seek optimum conditions for the development of the fragments. An attempt may also be conducted in one of our newly setup indoor marine aquaria, to give us more control over the water quality, water flow and lighting. This month we have been looking for Acropora corals on the wild reef, mainly seen at depths of 10m due to the cooler temperatures during the coral bleaching event earlier this year. Surviving corals on shallower reefs show higher resilience or are located in more favourable conditions. 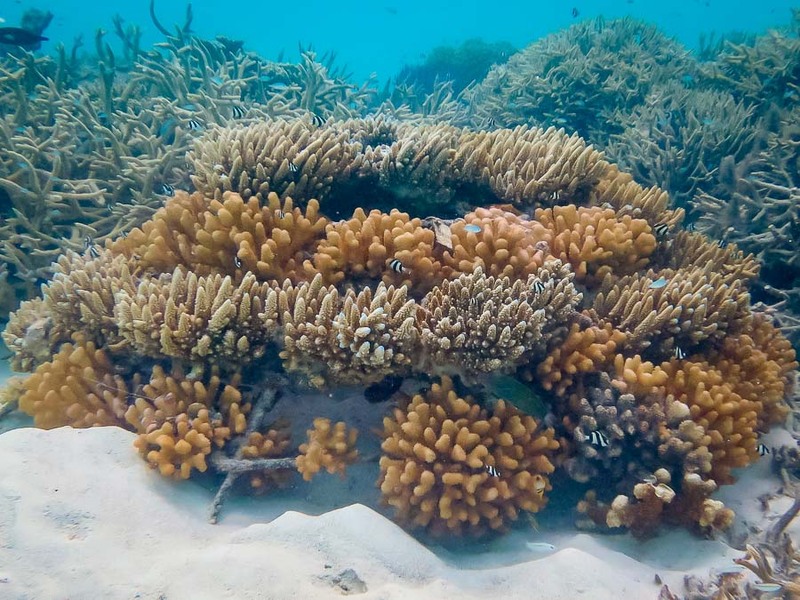 At the snorkelling site of Makunudhoo we have observed healthy branching and digitate Acropora corals; some colonies are doing well, but others are suffering from predation by Drupella snails and Crown of Thorn (COT), leading to tissue loss and algae cover. At Girifushi (a Maldives government military island) we see a variety of healthy coral species, mainly Pocillopora and Acropora. It is interesting that these two reefs are exposed and perpendicular to the outskirts of the atoll. 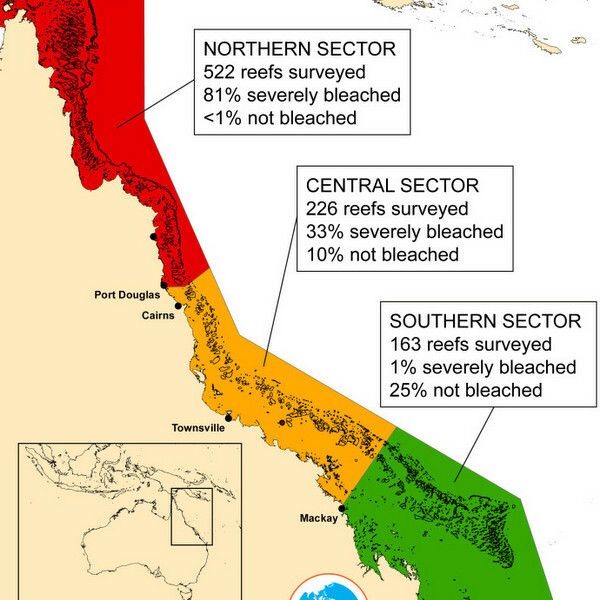 (For both sites, the SW-facing reefs were monitored, whereas the NE sides have yet to be visited). or visit our Coral Frame Collection to see the latest photos of your own sponsored frame.